A fitting name for this West Hollywood eatery, fresheast is just that: tons of fresh ingredients used in a multitude of eastern dishes. And by eastern, I mean Asian, ranging from Chinese to Korean to Indian. The varied menu features noodles, salads, sandwiches, and bowls, along with a fresh juice bar and DAILY (!!!) happy hour. Although right on the easy-to-find corner of Robertson and Santa Monica Blvd, the place is a bit hidden, and there isn't a clear sign viewable from the street. It's sort of tucked underneath a huge aluminum structure, so you'll probably drive right past it a few times like I did. 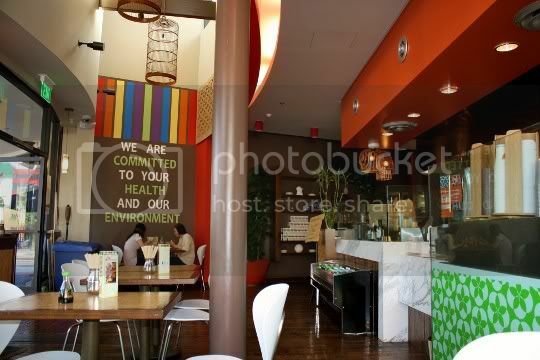 The interior is zen-like and colorful, with high ceilings and wood tables and floors. Although it is underneath another building, there's actually a lot of natural light streaming throughout the restaurant. The vibe is very Asian, very modern and minimalistic, with really cool hanging birdcage lights and sparsely placed plants. The menu is both vegetarian- and vegan-friendly, with each item clearly marked for designation. The counter staff is also very knowledgeable and ready to answer any questions about ingredients or dietary restrictions. I do think fresheast would benefit from adding a tofu option to the menu (hint hint), as veg peeps are pretty much limited to noodle dishes and a couple of bowl entrees. Subbing tofu for the meat in other menu items would be a GREAT thing. Then again, any place that serves quinoa as a side option is all right by me! I'm actually not a huge fan of melon (the only one I can really stand is watermelon), so I found this drink to be surprisingly amazing. A blend of cantaloupe, lemon juice, and raw sugars, this is like a summery exotic version of lemonade. It's super cold and refreshing, although the texture is a little pulpy and slurryish. It's perfectly sweetened, and isn't overly tangy or tart. A wonderful pairing to some of the spicy noodle dishes below. 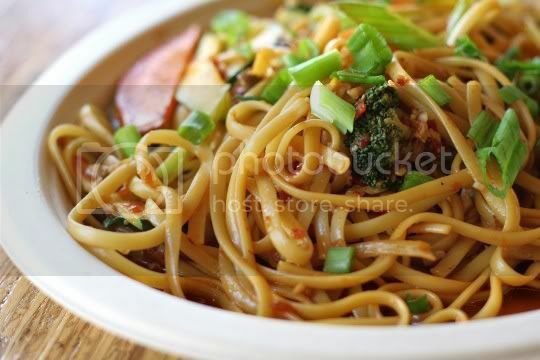 This is like an out-of-this-world chow mein. OMG, these noodles are so delicious! Super spicy and garlicky, tangy and salty, and served piping hot. 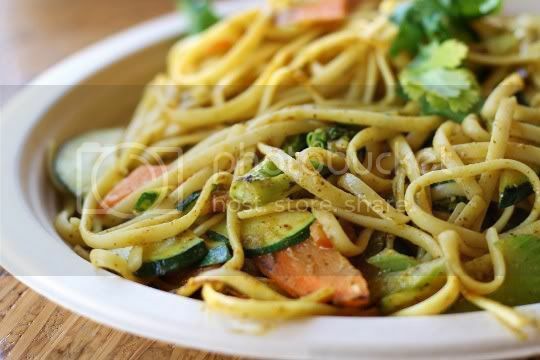 The thick, perfectly cooked noodles are whole wheat, and they're tossed with firm (i.e., not cooked to death!) carrots, zucchini, broccoli, green onions, and celery. Big red chili paste flakes mean business: yes, this dish is spicy and super pungent. The portion is a great size, and you can easily get at least two meals out of it. The only way this dish could be better is if there were some kind of marinated tofu added to it for a little protein and chewiness (fresheast, do ya hear me?). After eating the wonderful Spicy Garlic Noodles, I was a pretty disappointed in this dish. It's decent, not great. For something with "curry" in the name, I'd expect a LOT more gusto. That being said, it is definitely packed with curry and coconut flavor, and it's also a pretty spicy and pungent dish. The same carrots, zucchini, and broccoli mix are included, and everything is cooked perfectly. It's just very clear to my palate that something was missing: some salt, some tanginess, some sweetness, something. I added some teriyaki sauce to my leftovers, and suddenly they were stellar. Just a heads up! If you like the flavors of Korean cuisine (and sesame oil), you'll love this. It's pretty damn authentic tasting. Instead of just a plate of noodles, this is more like a full-on salad. Cold somen noodles are topped with little individual mounds of lettuce, broccoli, spinach, raw tofu (ah, there it is! ), bean sprouts, and cucumber kimchi. 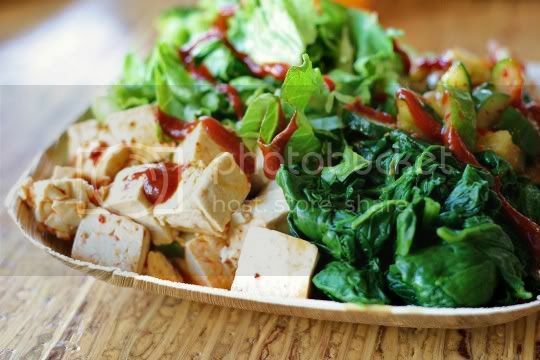 The broccoli and tofu are covered in a delicious sweet-spicy sauce, which also coats the noodles. The kimchi, however, is by far the best part of this dish. It's hits every flavor sensation: salty, sweet, tangy, and spicy. You can choose to mix this all up and eat everything together, or take bites of each component. The bean sprouts and spinach don't do much, but hey, it's always nice to get your veggies. This is best served immediately, as leftovers got a little watery and weird. But it's definitely big enough to feed 2-3 people! I can definitely appreciate the direction that fresheast is headed. 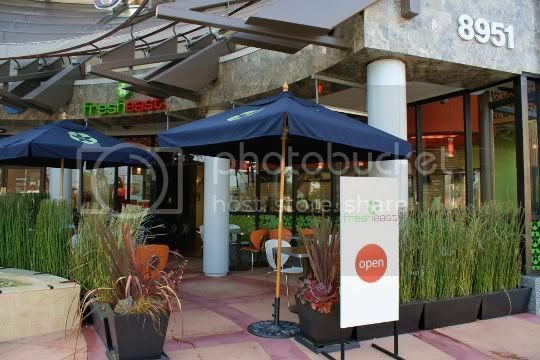 Fresh and healthy food, relaxing environment, and a daily happy hour, woo hoo!